WINFBB 7.00E has a bug when a station enters to the gateway. The callsign of the incoming station is hit as BBS and in the following calls for forward of the FBB in the AGWPE ports (Radio and Loopback), it assumes the same callsign of the user. 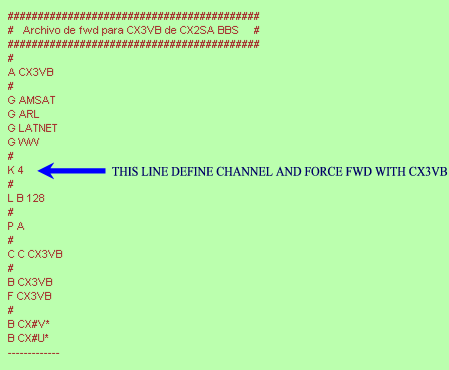 In an incoming call to a FBB the station connect usually using the lowest channel, and the following connections will go increasing the channel. This is also applied for the incoming forward. But when our FBB calls to somebody, or an user of another port uses the gateway, the assignment of channels it is inverse or descending. See the figure and also thinks you how can solve the inconvenience calculating the solution based on your own configuration of the BBS. 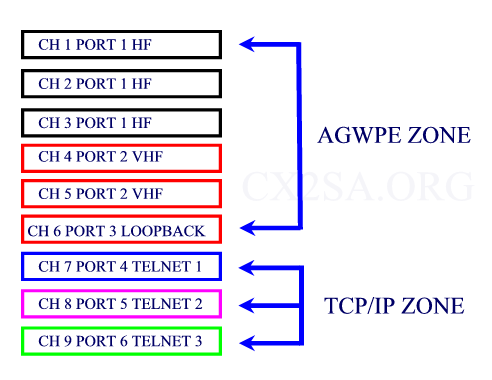 In the figure we have two defined areas: Radio ports and loopback called AGWPE ZONE, and a TCPIP ZONE that it corresponds to the TELNET configurations of the FBB. Analyzing the figure, we can see clearly that the highest channel in the AGWPE area is the number 6 that is assigned to the port loop-back, but in the practical AGWPE it assigns it dynamically to the first incoming connection of user or partner through the gateway or in the outbound forward connections. CX1XZ connect via TELNET in the port Nr. 6, by default he makes it in the channel 9. CX5BQ don't respond and CX1XZ abandon the BBS. But 10 minutes later FBB calls at CX3VB in the port 1 of HF. We see that the callsing of the BBS has been changed from CX2SA for CX1XZ. The channel 6 of the AGWPE was used firstly by the user CX1XZ and in the next instance for WINFBB in the call to CX3VB. To solve the bug I forced the WINFBB so that the call at CX3VB was made in the channel 4, and the problem was solved. 3) Quantity of channels for forward at the same time in each FBB port. I recommend you one channel for each radio port (not telnet) in the outbound forwarding. 4) Maximum estimated quantity connections of users that could use the gateway at the SAME TIME in RADIO ports or LOOPBACK. For example if it is 1, then add 2 more to the total channels because you need always free channels availables. To know which channel is NEVER to use with the K command in the forward file please add all the channels assigned to the entirety AGWPE ports of FBB. Then subtract to the maximum of channels, the maximum users at the same time + 1, for the example is: 6 - 2 = 4 for such a reason with a K 4, K 3 or K 2 would be solved the inconvenience. You will experience the good values.